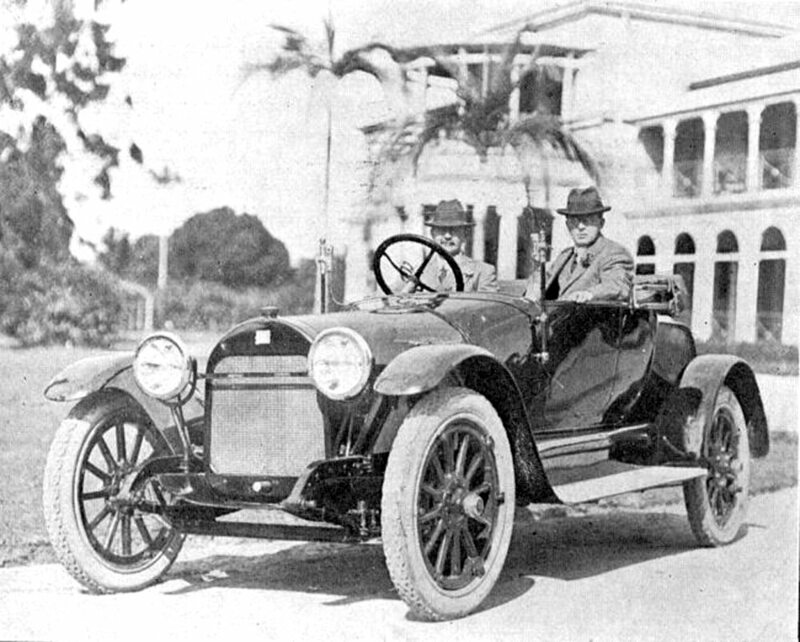 The occupants of the car are Mr. James Howard, Managing Director of Howard Motor & Cycle Co. Ltd., the “Buick” agents for Queensland, and Mr. W. J. Strachan (at the wheel), the General Manager of the Company. Last year the Howard Co. turned out something like fifty cars with special roadster bodies built in Queensland and this year aimed at turning out a special roadster body that would he equal to anything on the Queensland roads, and the general opinion of motorists of Brisbane is that they have achieved this object. The seating accommodation is roomy for three and only the best materials have been used throughout. The carrying capacity of the boot has been well thought out; this carries the spare rim and tyre, apart from which there is a tool receptacle in the floor of the boot; it has also openings both at the top and the rear; a receptacle has also been arranged in the rear for tools that are most required. The hood is of the genuine one man principle; the windscreen, as can be seen, is of the frameless type. The lines of the body are very uniform, the difference between the height of the back of the seat and the radiator.cap being only three inches, although it has the appearance of more than this. The Howard Motor Co. are also turning out a five-seater touring body on similar lines, both models being very much admired. The car illustrated has been selected by the occupants for use in connection with the Company’s business. The design of the body and the supervision of the building of same goes to the credit of the Company’s Sales Manager, Mr. Albert Harrington, and it certainly does him credit. The Howard Company advise that they have had a tremendous demand for 1915 model Buicks right through the year and up to the present they have never had stocks on hand to he able to give immediate delivery when called upon ; orders have had to he booked in every case from shipments to arrive. Although they have sold a large quantity they are certain that had stocks been available they could have easily disposed of fifty more of them. On two successive days orders for ten Buicks had to he turned down through not being able to give reasonable delivery. “Buick” cars today are very conspicuous by their number on the Brisbane Streets, but the Company advise that the largest quantity of their cars have gone into the country, and from all parts of Queensland they have received nothing but glowing accounts as to the work the new Buicks have been doing.